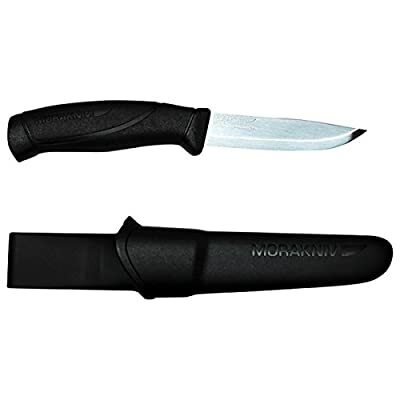 The Morakniv Partner Fixed-Blade Outdoor Knife is actually an all-in-one knife for exterior fanatics, suitable for carving, food preparation, as well as reducing tinder as well as timber. Featuring a 4.1-inch, three-quarter tang hardened Sandvik 12C27 stainless steel cutter, it preserves an upper hand as well as keeps pointy longer than carbon steel, as well as is actually far less susceptible to corrosion, for exterior as well as marine apps where blades are frequently left open to dust as well as moisture. A patterned, high-friction grasp sits comfortably in the hand, for better command, security, as well as functionality, specifically in damp as well as cool health conditions. An essential knife for backpacking, hiking, searching, angling, as well as survival/emergency readiness, the Moraniv Partner possesses a cutter span of 4.1 ins (104 mm), cutter thickness of 0.1 in (2.5 mm), general span of 8.6 ins (218 mm), as well as body weight w/ coat of 4.1 oz. (116 g). Includes a color-matching plastic coat with a waistband clip. Manufacturer's restricted life-time warranty. Made in Sweden.